Christopher Plummer as the exiled Kaiser Wilhelm II in The Exception — a man with the outward trappings of power, who hasn't made a real decision in decades. 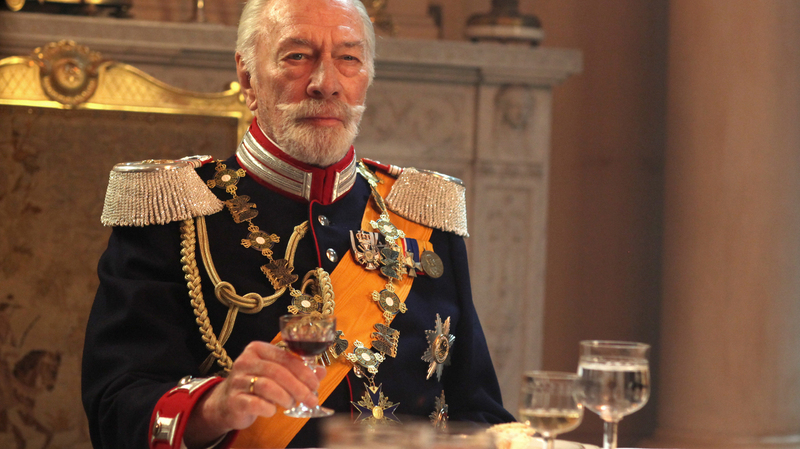 Director David Leveaux says the Kaiser was a complicated figure, someone who bore a lot of the responsibility for the conflagration that was World War I. "It's interesting that a man carrying that degree of guilt on his shoulders, at the same time as being almost unremittingly hubristic and reflexively culturally anti-Semitic — all the things that he had about him make him quite a complex character to tell a story about, simply because he is neither good nor wholly bad." That is the premise of the film, which is that with the ascendance of National Socialism and Hitler in Germany, the completely delusional notion that possibly they might want their former emperor back, even in a sort of symbolic way. And the film turns very much, ultimately, on the Kaiser coming to recognize that the Germany as represented by National Socialism and the Nazis has nothing whatsoever in common with the Germany of his own memory. He was really quite fearless about wanting to play, sometimes, some of the ludicrously foolish aspects of this old man ... he's a man who has a hundred uniforms, but hasn't made a decision since 1918, about anything except possibly what's for dinner. And Christopher's sense of the theatrical nature of the man, in other words, a man wearing the outer garments of power, but with no power himself, was also an inherently comedic idea. ... Also, by the way, he was known very fondly by the younger actors as "One-Take Plummer." We felt it was very important to be clear and honest about the fact that that man had an almost knee-jerk, reflexive, and I'll call it cultural anti-Semitism. He grew up with it, it was part of his set of beliefs, but one of the things we were also aware of was that in the entire time of his reign, there was never a directly, specifically organized campaign made against the Jewish community in Germany, that obviously came with the rise of National Socialism. And the reason why I'm putting it in those terms was that it was passionately important to me, and to Christopher, to be able to show what happens when a person harbors any form of uninterrogated racism or bigotry, what happens when that person encounters a person who is willing to take that reflex prejudice and bigotry to the next level. ... I was interested in delving into the psychological processes of a lethal kind of bigotry, and the way it can lie dormant in a character like the Kaiser, who thinks of himself as being Christian and good.